Fruit can make good still life subject – either whole or, in this case, sliced and backlit. 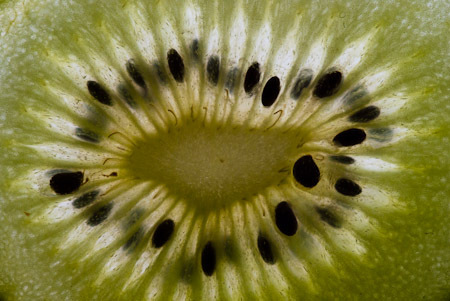 Certain fruit such as kiwi, lemon, lime, orange look great when lit from behind as the light shining through makes the slice look almost translucent with the seeds and textures picked up as interesting patterns and shapes. Cut the slice thinly for best effect. It’s a good subject to fall back on if you’ve not got anything else lined up to photograph as I hadn’t tonight. I used a Jessops light box as illumination and placed a slice on a cd tray to avoid messing up the lightbox. It was taken with my Pentax K10D and 100mm macro lens. I underexposed by a half stop to get increased saturation and richer colours.